Also Called: Littlepod, smallseed falseflax. Stems: Erect, unbranched or branched above, rough-hairy, lower stem with long hairs, upper stem less hairy. Leaves: Alternate, simple, sesile, lower leaves clasping, linear to lanceolate or arrow-shaped, 1-3 inches long, rough-hairy; margins nearly entire or slightly toothed, basal rosette usually withered at flowering. 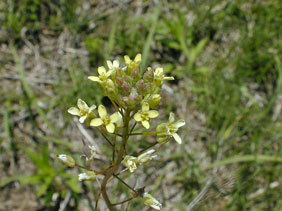 Inflorescences: Raceme, 2-12 inches long, elongating with maturity, many-flowered, terminal. Flowers: Sepals 4, erect, hairy, tips mostly rounded; petals 4, spatulate, about 1/6 inch long, pale yellow; stamens usually 6; filaments linear; athers ovate; 2 short stamens flanked at base by pair of tiny glands. Fruits: Silicle (pod), pear-shaped, about 1/4 inch long; beak thread-like; stalk about 1/2 inch long; seeds few to several in each cell, oblong, ridged, reddish-brown. Habitat: Fields, waste places, roadsides, and disturbed sites; usually sandy soils. Origin: Small-seed false flax is native to Europe, was introduced to the U.S. in flax seed, and is now naturalized. Forage Value: Birds that forage on the ground eat the seeds. Uses: The Apache boiled and ate the seeds and used them to make flour.